Stuck in South East Asia? "...However, there remains much hard work ahead and we will continue to strive towards our goals, work on other areas in which we are lacking, and bring Singapore football to the next level." said FAS President Mr Zainudin Nordin in a media statement (source: 1, 2) that lauded the achievements by the team and various individuals from victorious Suzuki Cup winning side in the inaugural AFF Awards 2013. In the ceremony held yesterday in Kuantan, capital of the Malaysian state of Pahang that saw former Lions' coach Raddy Avramovic and Shahril Ishak clinched the "Coach of the Year (Men's Team)" and "Player of the Year (Men)" awards respectively with the likes of Fahrudin Mustafic and Baihakki Khaizan named alongside with Shahril in the "AFF's First XI". While the crowning glory was to appreciate the efforts shown by the national team in the biennial regional tournament with the bragging rights to be called the “Kings of Asean Football”, it didn't hide the fact that Singapore football isn't exactly building up from its success after its unprecedented fourth Asean title. 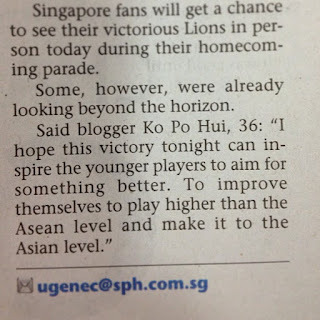 Following the public adulation that saw the Lions being welcomed home to a thunderous reception at the airport with the fan parade at the Jalan Besar Stadium, suddenly, the harsh reality hit upon the new-found confidence in the local football scene that seems to plummet to new lows at the turn of the year. Armed with the tag as the reigning Asean champions, the team travelled to Amman to face Jordan in the Asian Cup Qualifiers and saw them being ripped apart by the hosts 4-0, such a wide gulf of standard is best summed up in an article posted on Al-Jazeera website not that long ago, in which I quoted. “Southeast Asia is something of a bubble. Once you are in it, getting out can be hard and the same goes for national teams that play each other far too often instead of testing themselves against outside forces. The AFF Suzuki Cup – the region’s biennial tournament – is fiercely contested but increasingly ignored by the wider world.”. Adding salt to the wounds of the stagnancy is the recent poor showing on the continental front by the two Singapore representatives in the second-tier AFC Cup, which traditionally seen as seamless cruise from the group stages to the knockout phrase in the recent years, but not this time round though had done little to cushion the impact so far. The defending Singapore Cup winners Warriors FC (formerly known as SAFFC and the Republic's sole representative in the prestigious Asian Champions League to date) saw themselves gunned down 3-0 by Churchill Brothers in India on Tuesday. Whereas, S.League champions Tampines Rovers failed to translate their brilliant domestic form in their Group H encounter against another sub-continent club East Bengal a day later in a thrilling 4-2 defeat (video highlights above) at Jalan Besar Stadium. Hence, the irony of the release of the AFF Awards' results came at a timing when the Stags just confirmed their spot at the foot of the standings in their Asian adventure after the loss to their Indian opponents. I think if you look at the entire league, the talent pool not only has not grow, but has become smaller. Think of the numbers: 8 local clubs, 15 SG players each if they fill up their 20 men squad, 120 players. Minus out the reserve GK, 3-4 bit part players per squad, and those retired from internationals, basically we will be very lucky if we have 60-80 players to choose from. This depth, while probably envied by other Singaporean sports association, is simply not competitive at the football level in Asia. That is the part about National team. For clubs playing continentally, they also don't have enough depth to compete. The 20-player limit will not have enough cover, while the salary cap and lack of funds prevent us from getting the best of foreign players that can compete at this level (think the Kitchee foreigners, Saigon African duo, or even Francis Doe of Selangor). The fact is we need foreign players to punch above our weight to get anything continentally, on top of good locals. I can tell you quite simply why Singapore football suffers..... its glaringly obvious to anyone from outside of Singapore. You lack quality coaches and the Singapore Government makes in impossible to get a Work Permit for them to come in. Singapore simply does not have good coaches, the childrens children of the coaches may be good coaches but football has to run through a family for generation after generation after generation... I found it near on impossible to get a work pass in Singapore and sadly had to leave...a long with A LOT of other superb UEFA/FIFA coaches... the Young people were gutted to lose us... the Government did not care. Singapores standard of refereeing too is terrible and they simply will not listen to outside advice. Finally, SUPPORT, noone supports the local teams.. The Singaporeans want a quick fix...they want to see success straight away...the Club I support has not won the national cup in over 100 years...I still support them and I still love them dearly. Supporting is not all about winning, its about community and pride and passion and family. 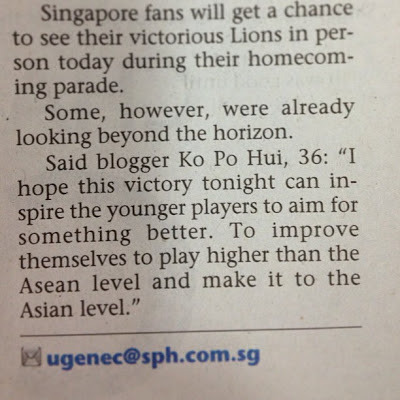 The clubs dont realise that, the Singapore FA doesnt grasp that and the people simply dont care enough. Am I being harsh? Maybe...Am I being truthful? Absolutely. There is a need for the clubs to have far stronger community links. Some clubs do better than others in this regard however as long as the clubs don't rely on the community's support for their existence & success then the incentives to engage the grassroots are less. One approach for clubs to better link with communities in a place like Singapore with limited playing area is through futsal. As Richard noted, we should be encouraging people to turn up to enjoy the spectacle of live sport, not because they expect roaring success.